You won't find another blanket that baby will love more than this one! This unique gift set features a 30 x 40 inch luxurious, super soft baby blanket with satin lining and a new plush teddy bear - perfect for welcoming the new arrival! 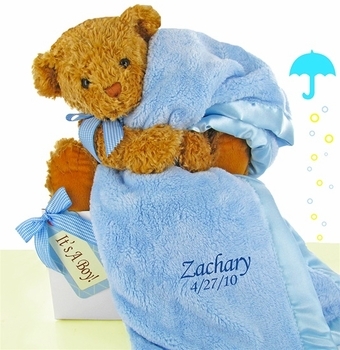 The blanket comes personalized with baby's name and birth date for an extra special gift. This set comes wrapped with matching ribbons in a glossy white gift box.